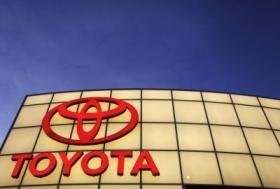 COLOGNE, Germany – Toyota's European production returned to normal levels in June and the automaker could, in the second half, regain the 40,000 units it lost due to the parts shortage that followed the earthquake and tsunami that devastated Japan March 11. "In June, Toyota production in Europe returned to its normal level and we are confident the parts disruption – at least for Europe – is now behind us," Toyota Motor Europe Vice President of Purchasing Mark Adams said in an interview on the sidelines of the Automotive News Europe Congress last week. Adams said Toyota Europe lost about 40,000 units of production, mainly due to a disruption of electronic components coming from Japan. The main systems affected by the part disruption were airbags, ventilation and air-conditioning units, engine management systems, and a shortage of pigment for use in metallic paint. Most of the disruption occurred in Europe, both to European suppliers and to the European operations of global suppliers. "The lack of components mainly occurred to the Tier 2, 3 and 4 suppliers, so it has been really hard to go back into our supply chain to find exactly where the part was missing and to help the supplier in quickly finding alternative sourcing," Adams said. He noted that while Europe is back at full production, the Toyota parent company in Japan is still running at about 90 percent of its capacity. "To better balance the shortage of power, our colleagues in Japan are accepting quite inconvenient working weeks, where they rest on Thursday and Friday, while working on Saturday and Sunday," he said. Adams said that Toyota could regain the production lost in April and May during the second half, but that nothing was decided yet. "First, we need confirmation we could be shipped the extra parts we need to regain the volume we lost, but also that the customer order inflow would require building an additional 40,000 units in the second half," Adams said. Toyota sales in Europe declined 5.4 percent to 245,254 units in the first five months of the year, according to data from industry association ACEA. Of the 13,944 fewer Toyota sales this year, 4,896 units were lost in May alone, when the Japanese brand's deliveries fell 11 percent in an overall market that grew 7.6 percent, ACEA figures show. Adams declined to elaborate on any future actions Toyota could take to prevent another part disruption like this in the future, but admitted that single sourcing is being reassessed. "In the purchasing business, nothing is a dogma and everything should be put under review every time you see an opportunity for improvement," Adams said. "Nevertheless, I think single supply should be reviewed not only looking to have two suppliers for the same part, but also supplies coming from different manufacturing locations."